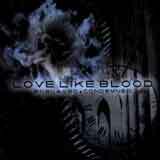 Love Like Blood is the godfathers of German Gothic Rock and this Enslaved + Condemned follows their previous piece Snakekiller. I can't really explained it, but this record reminds me Evergrey's last record (same label, coincidence ?). Well Evergrey's music is more power/prog and Love Like Blood's music is more gothic rock, but somehow ... very similar. The opening Love Kills is quiet catchy, but the chorus "stinks", Cry Out (2nd track) has a Paradise Lost's touch (Draconian Times) with an aggressive chorus (almost a power/heavy metal one). Dying Nation is one of the killer-song and will remind you again Paradise Lost ... but this time the Host album. Slow Motion (4th song) speaks from itself. And till the end of this gothico-rock piece, Paradise Lost will be present (I guess the singer highlights even more this impression of "déja-vu"). A nice album ... but my taste will tell you Evergrey or Paradise Lost (Draconian Time) are much more interesting, much more complex, much ... better. But of course, this is just my taste. Give a try, especially for those of you who like Paradise Lost. Who said Gothic ?